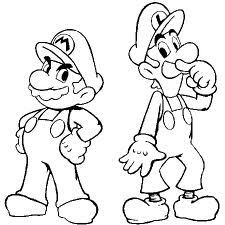 Mario and Luigi colour in. . Wallpaper and background images in the सूपर मारियो ब्रोस club tagged: mario super mario brothers. This सूपर मारियो ब्रोस fan art might contain भ्रूण कोशिका, प्रारंभिक सेल, कृत्रिम कोशिका, भ्रूण कक्ष, and प्रारंभिक कक्ष.